Jessica Keenan, Lily James and Alexa Davies play the young Rosie, Donna and Tanya in "Mama Mia: Here We Go Again." The flash-forward involves a reunion starring Pierce Brosnan and many of the original film’s other actors, meant to memorialize a recently deceased Donna (Meryl Streep, in a movie-ending fantasy sequence that should’ve lasted longer). Once again, a picturesque island and a hostelry and church thereon serve as the setting. HE: I’d assess “Here We Go Again” as a grade “C” movie. Too much a knockoff of the original “Mamma Mia,” which I liked a lot more. Plot elements of “Here We Go Again,” characters, venues—too little is fresh. Even some of the songs are recycled (although, I have to confess, “Dancing Queen” is a tune I never get tired of hearing). Ironically, that “Here We Go Again” part of the title could be considered a sarcastic comment on the sequel. SHE: I disagree. I think there was a lot that was fresh here. I love the way they segued the past with the present. The editing was brilliant. Also, the song and dance numbers had so much going on, so much fun detail, like when the young Donna sings “Waterloo” with the young Harry (Hugh Skinner) in a Parisian restaurant and their heads pop out from under a huge lid on a cart. HE: Past with present … yes, I liked the juxtaposition in the final number of performers who played the same character at different times, like Skinner and Colin Firth for Harry, and Brosnan and Jeremy Irvine for Sam. I like the song “Waterloo,” and the song “Fernando,” but I thought the scenarios created to showcase them were kind of corny. Andy Garcia as Fernando and Cher as his paramour-turned-Sophie’s grandmother left me cold; Cher’s a long way from her “I Got You Babe” days and their number really seemed forced. And a childbirth sequence highlighting Lily James, while antiseptic, seemed a needlessly heavy inclusion. 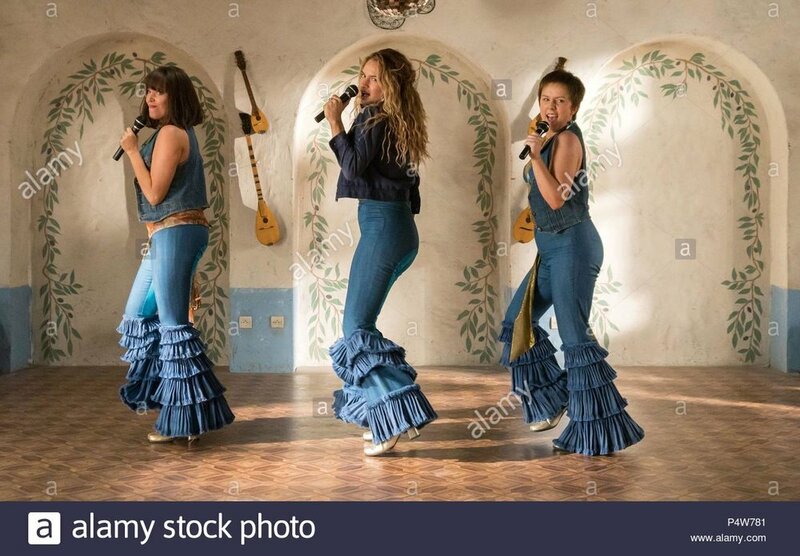 “Mamma Mia” made a boatload of money in 2008. High art took a backseat this time to the filmmakers’ desire to make a boatload more. SHE: Wow! I thought it was beautifully filmed, especially on the island, as in the first movie. “Dancing Queen” played out on a half-dozen boats filled with people, plus a shore full of people. Such fun. I loved Lily James as the young Donna—she captures her character’s high spirit and love of adventure. But I really disliked not seeing Meryl Streep until nearly the end. The song she sang with her daughter (who imagines her there) at her grandchild’s christening is one of the most beautiful I’ve ever heard on screen. In that one scene, Streep shows why she’s the best there is. HE: Finally something we can completely agree on. Streep (who’s got a very nice singing voice) is the best thing about this movie. I’d also agree that her song is first-rate. But the film is not, can’t hold a candle to the best musicals of late, “La La Land” or even “The Greatest Showman.” Performer-wise, besides Streep, my favorites included Firth; Stellan Skarsgard as Bill, another of the Dads; and Julie Walters, reprising, as did the others just mentioned, her 10-year-old role as dear friend of Donna. By the way, you haven’t revealed your grade for this sequel. "Mama Mia" Here We Go Again" is rated PG-13.